Was founded in 2001 by a number of local professional mountain guides, led by official Tourist Guide, Paulino Tínoco Depaz. We were all born in Huaraz and since childhood we have explored the magnificent natural areas of our region. Our goal is to share the beauty of our home and traditions with all visitors respecting the environment and the local culture. We provide high quality equipment and professionally qualified stafff for all your needs. We can arrange any tour and any group size according to its specific requirements. From assisting a lone backpacker with directions to organizing a climbing expedition to the highest mountain in Peru. We will also help with lodging and organize private transportation. 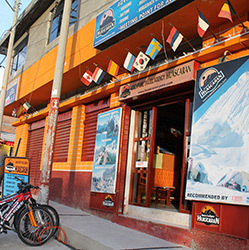 Huascaran Adventure Travel Agency Team.